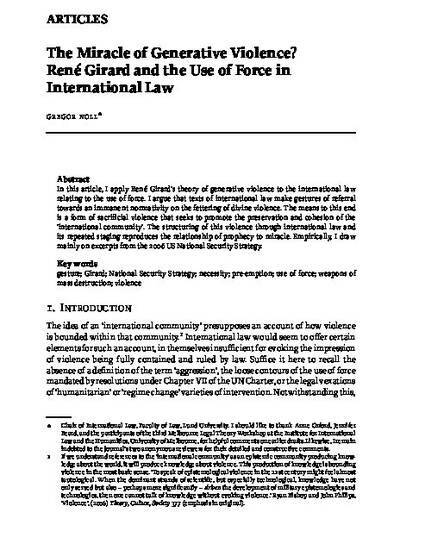 In this article, I apply Rene´ Girard’s theory of generative violence to the international law relating to the use of force. I argue that texts of international law make gestures of referral towards an immanent normativity on the fettering of divine violence. The means to this end is a form of sacrificial violence that seeks to promote the preservation and cohesion of the ‘international community’. The structuring of this violence through international law and its repeated staging reproduces the relationship of prophecy to miracle. Empirically, I draw mainly on excerpts from the 2006 US National Security Strategy. This text has been published in the Leiden J of International Law. The rights of Cambridge University Press are acknowledged.